Hummingbird feeders can be very attractive to sugar ants, so change the fluid in them frequently! Have you ever come home to see a huge trail of small ants that seemingly appeared while you were gone at work? It is quite possible that you have a sugar ant problem. The sugar ant is the common name for what are actually called pavement and/or pharoah ants. These ants will eat just about anything, so the key to getting rid of them is to eliminate the food source. Follow the ant trail to the food source. You can eliminate the trail, but unless you get rid of the source, they will just re-build it. Ants leave a scent for each other to follow. So even if the ants are gone, the scent will remain and other little scout ants can pick up the scent and begin the trail again. Get rid of the food source once you have found it. Don't just put it in the trash where they can then build a trail to the trash can. It's important to wrap it in some plastic or just take it outside to a trash can or dumpster. They may still be able to smell it, but it will take them a while to rebuild the route to that particular food source. Take your time when searching for what they are eating because it could be several things in different locations, even a greasy surface can be considered food so look closely. Wipe the trail free of ants with a paper towel that has been wet with warm water. Be sure to clean all surfaces where you see even one ant. If you have successfully eliminated the food source, they will not try to rebuild the trail on that particular path again. However, make sure that you do not have other things around that they could target next. 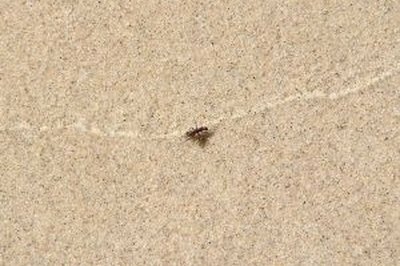 These ants can quickly pick up any scent of food and you'll have another trail the next day if you don't clean the place up! Spray the trail that you have just wiped down with ant spray that can be found at almost any store. After you have sprayed, put down traps for any ants that you might have failed to clean up. Some people like to spray and then wipe the trail clean. Just make sure you do both steps to remove any lingering traces of food. Ants will often try to carry the wounded or dead back home, so don't leave any stragglers either! The traps should take care of any scouts that return looking for food. Most sugar ant traps have some sort of sweet bait in them so check them regularly to make sure they are still working. They may need to be replaced if they are not.